"Cultures of Soul is very excited to announce this killer tropical reggae cover of Sade's 'Smooth Operator'. 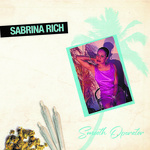 Recorded at Circle Sound Studios in Miami the backing track was recorded by members of the famous reggae outfit Inner Circle with vocals by local area rising star at the time, Sabrina Rich. Sabrina (her real name is actually Sabrena) had been making records in her and her ex-husband's studio in their garage for years. The result of which was the disco 12" Exit/Whispering. Around this time Sabrina was performing in the Palm Beach / Boca Raton area of Florida and performed with Jimmy Bo Horne. Sometime after Sabrina worked with a man named Kenneth Corey who mastered her recordings. Kenneth referred her to Roger and Ian Lewis of Inner Circle to help press up their vinyl. They became friends and around 1985 recorded 'Smooth Operator'. During this time they were working and partying hard and experimenting with different ideas and sounds. The track was originally released in small numbers as sort of a demo and never really took off. Shortly after Inner Circle went on tour in Europe and the single went into obscurity until many years later when copies of the record turned up in New York and Toronto. This 12" includes a special discomix edit by Duckcomb aka Patrick Billard, DJ and record collector extraordinaire."